• Ustaad Bismillah Khan, I am very grateful to you for agreeing to speak to us on our programme. Let me tell you I have very little to say, if it’s to talk nonsense. I don’t know anything but music; if you ask about that, I can say many things. • You must practice for hours on end. Oh endlessly. These temples of ours in Benaras—Balaji and Mangala Gauri—Balaji is a little lower, you have to go down the stairs, but Mangala Gauri is at a height. I don’t visit them nowadays; but the stones are the same, aren’t they? You bring gangajal, you go inside to offer it—but the stones outside are just the same. All you need to do is put your hand to them. • And where you place your hand, music and the heart become one. Yes, yes—just put your hand there and what joy you’ll feel. You can’t see it though, I’m afraid, it’s not something to be seen. • You have such power. If you sing just a few phrases from the Raag Malhar it begins to rain. My forefathers used to perform at the Balaji temple. Do you know what they were paid? Rs 35 or 40 for a whole month. When my grandmother performed, do you know what the deal was fixed for? 14 annas. • Khan saheb, you have never differentiated between religions, you believe all are one. They are one, absolutely one. It’s impossible for there to be division. This voice you hear, it’s that that we call sur. • I heard you once had an argument with a maulana from Iraq. He said music was blasphemy, and you made him understand that music is also a means to God. Yes, I set him right. • Tell us how you did it. It was nothing. He said music is evil, a trap of the devil, and you mustn’t fall into it. I said to him: Maulana, all I ask is that you be fair. Then I started singing, and when I finished I asked if this was blasphemy. • You reached out to Allah through music. What did the maulana say then? He was speechless, he had nothing left to say. I told him not to fall into these errors. I asked him if taking Allah’s name in the raag was wrong—that was all I was saying, though it was in Raag Bhairav. • So there is no difference between Hindu and Muslim in music—all music goes to one end? Yes—that same Bhairav I sang—any number of Hindus would agree that it was Raag Bhairav. • Khan saheb, among your contemporaries, you’re in a league of your own. When you got the Bharat Ratna, no one was in disagreement, everyone said it was long overdue. Look, this is the tool I use (holds up shehnai)—it is very dear to me. • You keep it with you always—you sleep with it near you. Yes I do. This is such a thing that when I lift it, I start thinking from my heart. As I said, the stones are the same, both inside and out. People sprinkle gangajal inside, but they never make an offering outside. I put my hand on the stones outside. • I heard that Lata Mangeshkar called to congratulate you when you received the Bharat Ratna. What did she say to you? Lata was overjoyed. She called me and said: Khan saheb, you’ve got the Bharat Ratna. By that time, other people had also told me, so I said: Yes, it’s come to me too. • Both of you had received it. Yes, I congratulated her. Lata is very melodious, it must be said. • Do you like listening to her? • Yes, she used to sing ghazals and thumris. She sang Deewana Bana De—it was a couplet. Many people have sung it, but when she sang, I would make it a point to go to the studio to hear her. And how she sang. I was asleep once—it must have been an hour or so after midnight. Somewhere, someone was playing one of the Begum’s records. The same one—Deewana Bana De. There was a strong breeze—I awoke and sat up to hear her sing. I was enjoying myself so much, I woke my wife up—she was very annoyed and she said, What’s all this in the middle of the night? I told her to get lost. • You said that to her? Yes, I did. Well, she was my wife after all. The next day, I got to know that what I’d heard at two o’clock in the morning wasn’t a record, but was Begum Akhtar herself. • And which of Lata’s songs do you like? Not anything in particular, but it’s her voice. As I said, not everyone has what she has. From the first time I heard her, I wanted to see whether or not she would keep her voice. But it’s still there, intact till today. Other people lose their voice, not Lata. Whenever she sings, it is always a pleasure. • There was also that song you composed for Gunj Uthi Shehnai. That, yes—Dil ka khilona— I composed it. What people have to say about it doesn’t concern me, so long as they liked the melody. You can say anything you choose—if you want to call me names, I’m ready to take them, but only, please, be in tune. I composed and played that song for the world, and the world enjoyed it. But this sort of thing isn’t to my liking. • Is that why you didn’t do any other work for film? There’s no way I would. • Khan Saheb, your contemporaries—Pandit Ravi Shankar, Bhimsen Joshi, Balamurali Krishna from the South—what do you think of these musicians? They are all very good—there’s no doubt of that. Bhimsen Joshi and I were great friends. • They’re all your friends. Khan Saheb, all your contemporaries have made so much money—they’ve built huge homes, they have several cars, they live abroad. And here you are: still in your old neighbourhood, living so simply at your old home. Have you ever had regrets? No, none. Here’s what I say—if anyone wants to meet me, they will have to come here. I will not go anywhere, whether it’s for a raja, a maharaja or anyone else. If I’m not in the mood, I won’t go anywhere for any amount of money. Look, this is my means (touches shehnai to forehead). By the grace of God, when this is in my hands, all the wealth of the world could be brought to me, and I’d say: Get about your business, take it away. So long as this one thing is with me, what need do I have for anything else? • No one should be grasping, agreed. But don’t you think it would have been better, with your large family, if you had organised your records and performances, built a house, accumulated some wealth? Yes, I have a family—but it isn’t in my nature, all this nonsense. Is there no joy in music—is it all to be this foolishness? There is beauty in my voice—I could sing, and after a while there would be tears in your eyes. • Everyone who hears you has tears in their eyes, and while they cry, they laugh as well. Yes, but that doesn’t happen for money. • So, you are not bothered with money. • But you would say that other musicians have been greedy, that this isn’t right? Yes, there shouldn’t be that. You don’t know this—I had gone to Pakistan once, and I didn’t feel at all at home there. There was this fence—look at one side and it’s Pakistan, look at the other and it’s Hindustan. I said to hell with it. I would say namaskaar to the Pakistanis and salaam alaikum to the Indians. I was there for about an hour—I couldn’t take the place, but I had a good laugh. • You didn’t like it there? No, not in the least. I just crossed the fence to say: I have been to Pakistan. • But when Partition happened, didn’t you and your family ever think of moving to Pakistan? God forbid. Me, leave Benaras? Never. • When India became independent, you performed at the Red Fort. Could you tell us about that? How can I tell you about it? I can’t express those feelings. I performed at the Red Fort—I went inside, there was a stage set up and it was a thrilling experience. But what exactly happened, who was there, I can’t recall. • You have seen so much of the world. You were born in 1914, when the First World War was on; you’ve also seen the Second World War, India’s Independence—the whole world has changed. But at this time, what’s happening in the world, violence, terrorism—what do you feel about it all? Nothing. Tell me, how many people are there in Hindustan? • More than a hundred crores. Everyone has a mind, right? Everyone thinks differently. Each one of them can’t be good, there will have to be some who will do bad. • But, Khan saheb, the world has started talking about ‘Islamic terrorism’, as though terror were intrinsic to Islam. Do you feel bad about that? No, it’s not like that. Didn’t I just tell you, there’s only God. I can sing to Allah in Raag Bhairav. • And you say that if you sing, it will start to rain. • Well, it’s started to rain now. It’s not like that. But a raag is a raag, you can’t change a raag. • What would you like to tell the world, and specially Muslims, about handling this problem? I do not want to say anything to Muslims. (claps) These claps are the rhythm, the flow. • You mean, when you are with the flow, you think of good things, bad thoughts will vanish of their own? How many people will you reform? How many thousands of people there are. • Yes, there’ll always be a few bad guys left. That will always happen. All the maulavis say one shouldn’t drink liquor, but people still do, don’t they? If others do wrong, let them. One should be firm about not doing so oneself. • Khan saheb, tell me—you’re 91 years old. You’re playing still, and there’s a glow in your face. How have you kept your health all these years—your health and your spirit? To look at you would lift a sad man’s heart. • When your begum left, this was by your side? Yes, this is all I have. • So, who are you teaching now; who will take care of the shehnai after you? My sons will be there. • When you listen to today’s film music—do you ever listen to A.R. Rehman? No. I am not in that line. I went into films once or twice. They wanted me to do things their way. I said: Am I here to learn from you? I just packed up and quit. They think they have so much money—they’ll throw a bit here and there, and I will be ready to do whatever they want. They could be playing all their lives, but they will never learn anything. I couldn’t stand it. They thought they would dictate terms—that I should do what they told me. It’s the other way around—I tell them what to do and they follow. • Khan saheb, you played when the country attained independence, and you played at our 50th Independence Day. My elder brother and I had ordered new clothes made of thick khadi specially for the occasion. There must be a recording of that somewhere, the country’s independence celebrations. I don’t know who would have it. • What is your message now for the country? I would say only this: all is still not lost. If you dedicate yourself to what you learn, if you practise it sincerely, you will lose all fear of what may befall you. • You can forget all your troubles in music? Things will happen around you, and you will stop minding them. It happens to me. I was waiting for you before the interview. That’s alright. But I will not play for any and everyone. It takes two hours for me to tune this, and then it plays the way I want it to. It won’t be that I’ll wish it to do one thing and it will do something else. No. I will tell it what to do and it will do just what I say. • Your message to the world is that people should think about peace, rhythm and harmony, and they will be freed of their troubles. Look, Hindu, Muslim, Sikh, Christian—whoever they are, they’re all one. Once people realise that and come into harmony with each other, there will be no more division. 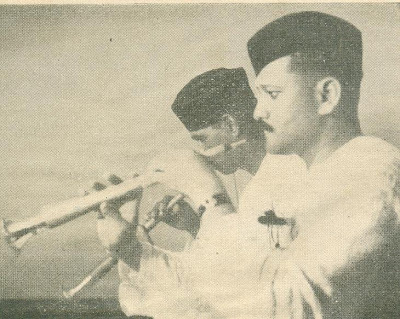 Bismillah Khan’s Jaunpuri from the SAWF Music Articles Archive. Shekhar Gupta has probably never been so stupid. He was clearly trying to make Khan Sahab give some sort of politico-religious statement instead of learning more about his music. Khan Sahab made it clear from the moment he told him about singing the name of Allah in Raag Bhairav. Luckily Khan Sahab despite Shekhar Gupta managed to squeeze in quite a bit about the nature of pursuing a subject as he sees it. what a master! this is a great interview …….